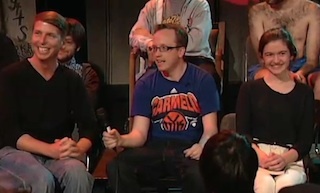 A few months ago, we introduced you all to the wonderful show that was going on under the radar on Manhattan public television; The Chris Gethard Show. The show, the terrifically goofy brainchild of New York comedian Chris Gethard, has steadily been building an audience with its comedy nerd mentality and “no cool kids” atmosphere. And, while we haven’t written about it in a while (despite the fact that we are all still devoted endorsers of Connor Ratliff’s presidential campaign), we couldn’t pass up on last night’s episode in which cast and crew of Saturday Night Live, 30 Rock, Chuck, and more surprised a 16 year old comedy fan and gave her advice. The background is that, before the show started, Gethard asked her Twitter followers who was the biggest comedy lover and got a response from a 15 year old gir out in the suburbs. Ever since, the girl, Alyssa, has called the show from time to time to check in. Last night, she appeared in person for the first time and Gethard arranged a few surprises for her. From the moment that stand-up Joe Mande announced that he totally understood why he was only the first surprise guest, it was clear that something special was happen. Whether you’re a comedy nerd or not, there’s nothing more charming than watching Alyssa be absolutely speechless when confronted by people like 30 Rock‘s Jack McBrayer. It’s all a lot of fun.